We've written previously on using architectural elements as design inspiration for custom wallpaper. It's one of our favorite subjects for wall murals, so don't be surprised when you see future posts dedicated to the subject. Hopefully the image of the mural above will instill in you the same excitement that we have for using architectural design features for custom wallpaper projects. Modern architecture is simply astounding. Gone are the days of boxy, boring design. Take for example the building's glass skin above; it undulates and bends around support structures like waves. The blue reflection of the sky on the windows helps to ensure this water-like illusion even further. It's such a natural yet utterly man-made look. And if it looks incredible in real life, it will certainly look incredible printed on custom wallpaper and installed in your home. This image is well suited for a full scale wall mural, or for a smaller mural above a chair rail or wainscoting. Consider shifting the wallpaper image from color to black and white for a starker presentation. With such an interesting custom wallpaper subject, additional design tweaks may not be necessary, but can customize your wall mural completely. 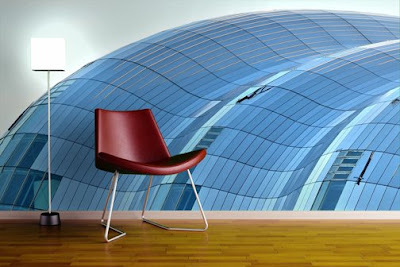 Enhance your space with an architectural element wall mural, contact us to learn more.